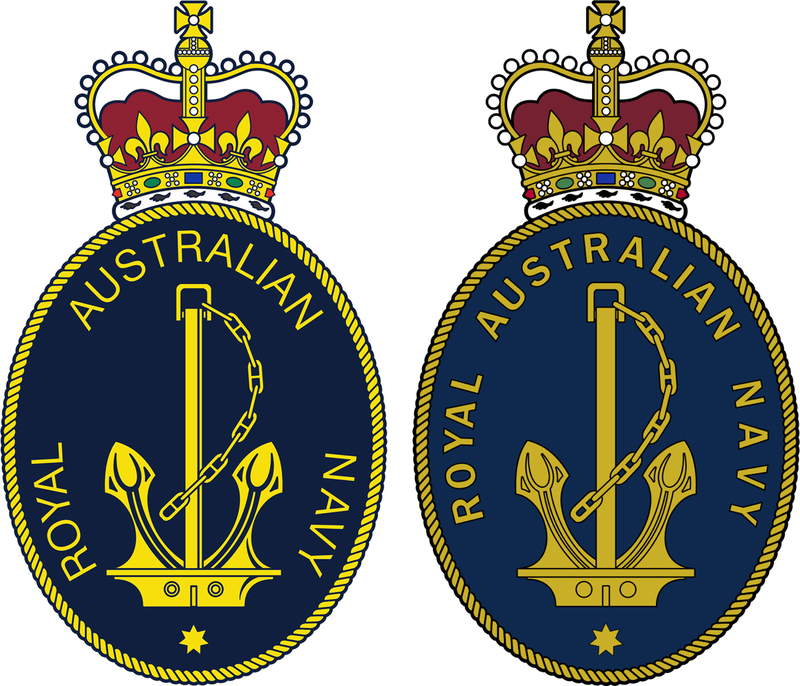 The official badge of the Royal Australian Navy (RAN), pictured right, was adopted on 23 August 1949 as a result of an inquiry by the Building Surveyor, Hobart, Tasmania, who wished to incorporate a naval symbol in a design for the Hobart Cenotaph. The badge was derived from a Navy office, booklet 'Advice to Personnel', 'The Navy List' and a rubbing from the badge displayed on the glass doors on the ground floor of the Coventry Street entrance to 'N' Block. The description of the officially approved design was promulgated in Navy Order 262/1949. It contained within a left handed rope surround, which displayed a knotted section in its base, a stockless chain cabled anchor, and four dots which were placed between a federation star and the words 'Royal Australian Navy'. Placed on top of the rope surround was the Tudor (Kings) Crown. Left: The official badge of the RAN instituted on 23 August 1949 per CNO 262/49. Right: The official badge of the RAN displaying the St Edward's crown, instituted on 3 December 1957 as per CNO 1149/57. The 1949 badge was then amended on 3 December 1957 (NO 1149/1957) by substituting the St Edwards (Queens) Crown for the Tudor Crown and right hand in place of left hand roping. 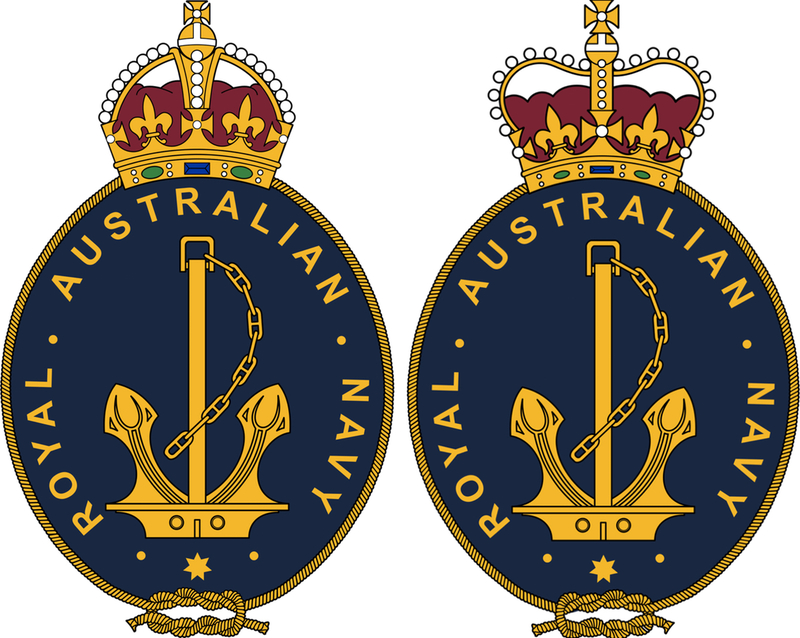 On 16 July 1968 the badge was again revised by eliminating the knotted rope surround in favour of a plain oval rope surround and the four dots which appeared between the words, Royal Australian Navy and Federation Star. Some thoughts are that the four dots from the original rubbing were duplicated in the original draft designs by mistake as they could have been the mounting screw holes that secured the badge to the door. Certainly this gives the badge even further mystery about its origins because no record exists about the designers or original designs that lead to the existence of the 1949 badge. Again speculation but with some sound knowledge suggests that the origins came from the Royal Navy (RN) as so many other RAN badge designs are derived from the RN. Left: The official badge of the RAN 1980. Right: The official badge of the RAN 2002, note the closer spacing within the words. The current 2002 official badge (right) has had a slight change since the development of the 1968 badge. 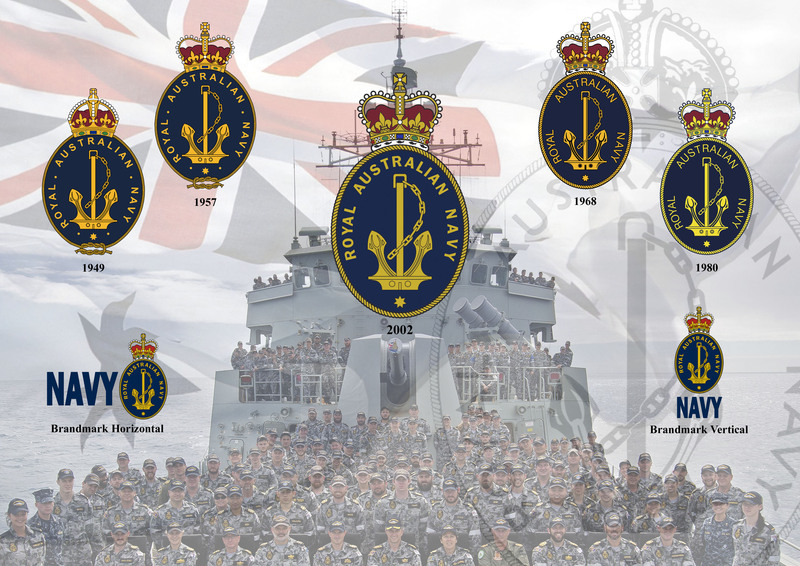 The change being in spacing the words 'Royal Australian Navy' closer together. The Brand Navy Master Identity and all navy badges and badge designs are protected by both international and domestic law - in Australia by the Defence Act of 1903 and various forms of trademark and intellectual property legislation, and overseas by international agreements and conventions protecting trademarks and intellectual property.